Scotland has a lot to offer – sea and mountains, rocky cliffs and sandy beaches, golden fields and muddy moors. If we have only few days to spare, it’s worth to go to the place that has a bit of everything, and if there will be some historical monuments – even better. All of those in almost unlimited quantities can be found on Isle of Mull and it’s little sisters Iona and Staffa. 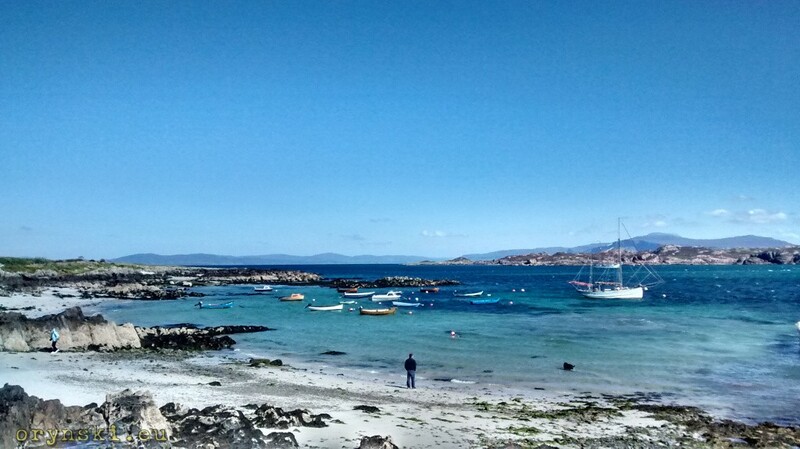 Mull, and especially Iona, are particularly popular tourist destinations and even tourists without their own means of transport can benefit from the wide range of excursions that offer ferry crossings and guided coach tour. But, as usual in Scotland, it’s best to explore Mull on one’s own, therefore going there in your own vehicle will be the best option. Motorised tourists can get to Mull by three regular ferry crossings. First, and propably most popular one, is the ferry from Oban to Craignure. I personally prefer the alternative option that involves driving towards Fort William to turn left after the village of Onich onto Corran ferry. After crossing, the road to Mull takes us back south (from two alternatives I recommend choosing smaller B8043 along the coast) to another ferry crossing in Lochaline that would take us across the Sound of Mull. This route involves a little longer drive, but unless we miss the ferry the total travelling time is about the same. And the additional advantage of this option is that one does not have to book those ferries in advance, so it allows more flexibility for those, who want to stop somewhere on the way, for example in Glencoe. The last option is a ferry connection between Kilchoan on the Ardnamurchan pennisula and Tobermory. But this is the longest way so it is worth taking only if we want to visit Ardnamurchan as well. After disembarking the ferry we face the question: where to now? And here let me share with you an useful tip: in Scotland many roads go along the coast, so if we are about to make a loop – like it is a case for Mull, that basically involves driving around the island – in order to be able to take more pictures without getting out of the car, choose direction that will see a passenger sitting closer to a sea than a driver. So for RHD car is best to drive around Mull clockwise, for LHD cars – counterclockwise. Assuming that we travel in RHD car, let’s go left, that is east. Here, near the most easternmost point of the island there is a mighty Duart castle that sits on the rock, overlooking the strait. This place is well worth the visit even if we are not interested in visiting the castle istels, as from here you might see an amazing panorama in three directions. 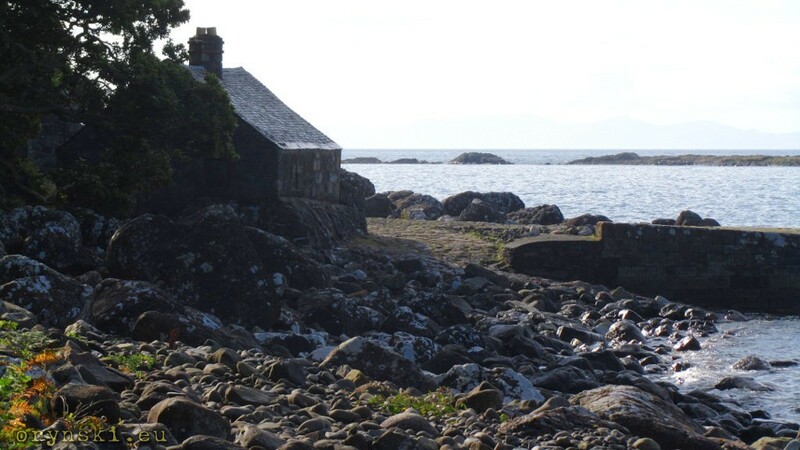 On the left, you will see a Sound of Mull with mountains of Ardnamurchan towering over it. Ahead on the little rock at the southern tip of Lismore island, there is a beautiful white painted Lismore Lighthouse, that guides ships and ferries that cross this stretch of water very frequently (as apart from Mull ferries, this is a route for the ferries going towards Outer Hebrides). Behind it you might be able to see a truss of Connel Bridge with peaks such as Beinn Sgulaird in the backdrop. To the right, a broader waters open with the Kerrera island visible in the distance. Behind it a town of Oban is hidden. On your return to the main road, the narrow stripe of tarmac will turn more west. 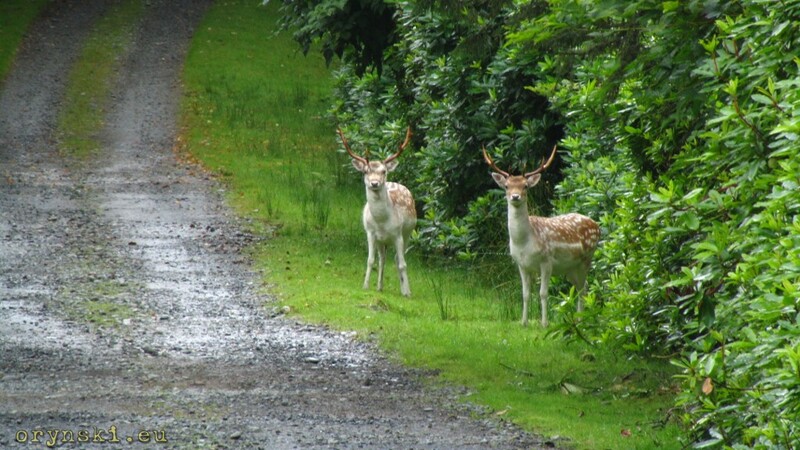 Here, after passing one of the bays of Loch Spelve you can turn left. The road going along the bank of the loch will take to the bay on it’s another end (Loch Spelve is shaped as a letter T) where at the junction with stone mailbox one can turn left to continue along the bank of the Lock. 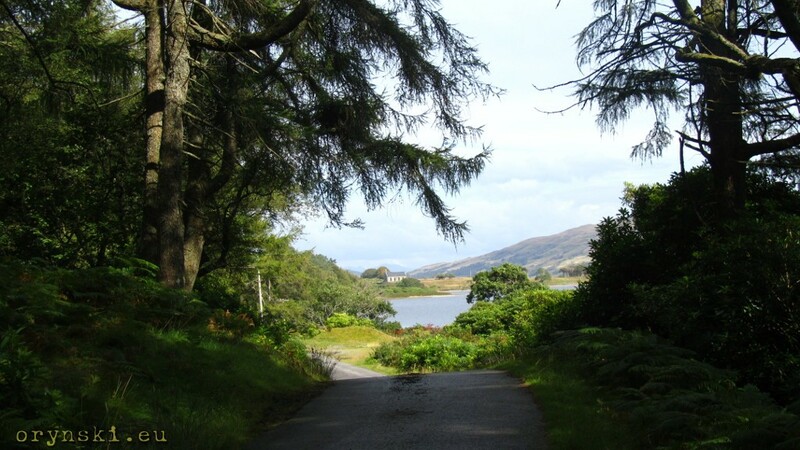 This road goes to a little village of Croggan, where apart from beatiful views and abandoned pier there is not much more than a blissfull nothingness. If you would rather see something, keep going alnog the main(er) road. 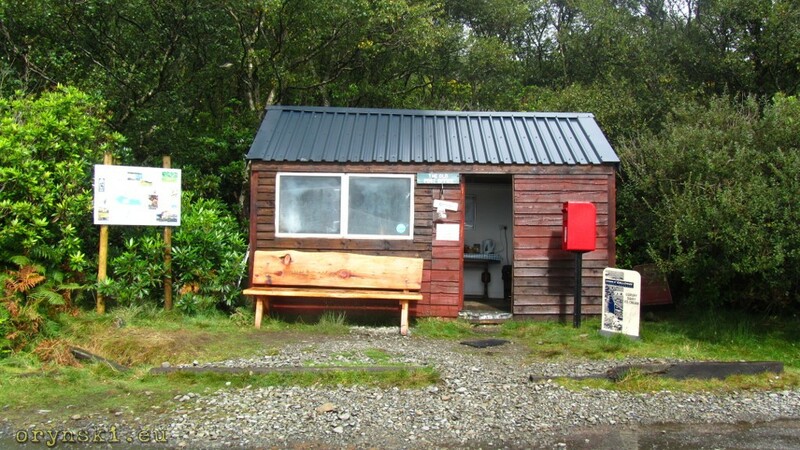 Here, at Lochbuie apart from plenty of rhododendron bushes and truly self-service shop (there is no shopkeeper, you pay by dropping coins into the moneybox) offering food, snacks and souvenirs (and also provides facilities to have a tea or coffee) there is a really nice area to have a short walk along the bay. Park your car at the little car park in front of the shop and start walking eastwards along the bay. First you will pass a couple of houses and a little church and then, after crossing a stone bridge over the river that meets the sea here, the path leaves the road and leads to the right to detour Lochbuie House (but it’s not worth to bother it’s inhabitants, as there is much nicer view from the path). This 200 years old home of MacLaine family was build when the nearby Moy Castle turned out to be too old and too small to be a seat of the wealthy family. The path get’s back to the road next to the castle and then, after few hundred meters there is another junction. Going left, one can reach standing stones (available also from the main road, but from both sides a boggy field has to be crossed). Going right, the road will take us along few bends after which the view to another valley will open. The valley ends with a beautiful sandy beach. In the valley there are some farm buildings, but if we choose a lesser user road, we will be able to reach an old medieval church, that has become MacLaine’s family mausoleum. Seasoned walkers can also choose to walk in opposite direction, as there is a nice walk from Lochbuie to next settlement west from it – Carsaig. But this path is rough and tricky, and some parts of it are under water during hight tide. Therefore the good news is, that you can get to Carsaig by car – it’s enough to get back to the main road and turn left towards Fionnphort and then turn left again in the little village of Pennyghael. This little road takes you throigh a nice valley and then goes sharply into the forrest. The last part is a steep descent over really narrow and bendy road that will take you to the small jetty with a couple of stone sheds build next to it. A small car park at the end of the road can accomodate only three or four cars, so please be considerate and try to take as little space as possible to allow others to park there as well. 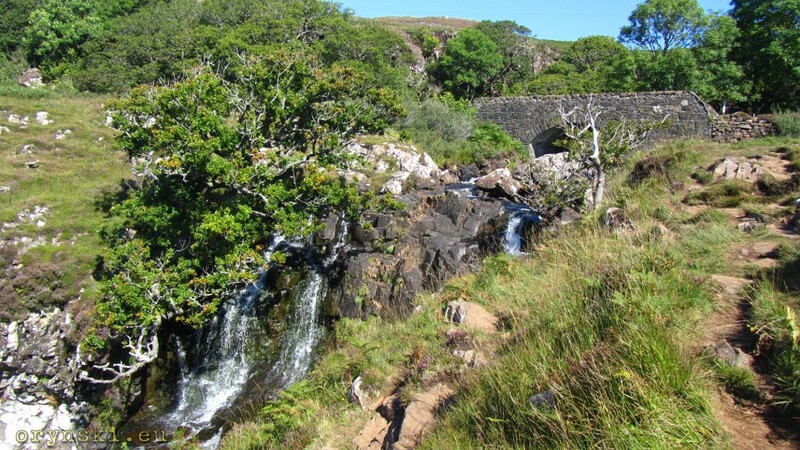 Walkers use this place as a starting point for their hike to Carsaig Arches few hours walk West along the coast. But if you are not up to challenge, it is still worth to visit Carsaig, especially that not many tourists reaches this lovely spot. Enjoy it till it lasts, as more West you go, more tourists you are going to meet. 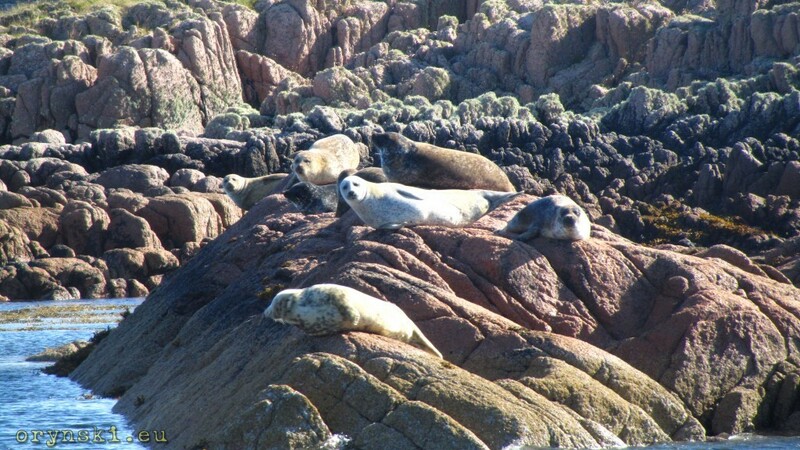 Closer to Iona, the impact of mass tourism can be visible. The whole area is plastered with “NO CAMPING” signs and less or more luxury B&B’s. Here also the white spots on the green grass on closer approach will often turn to be a row of ugly caravans or motorhomes rather than grazing sheeps. The village of Fionnphort itself is a little hamlet dominated by a huge concrete car park. 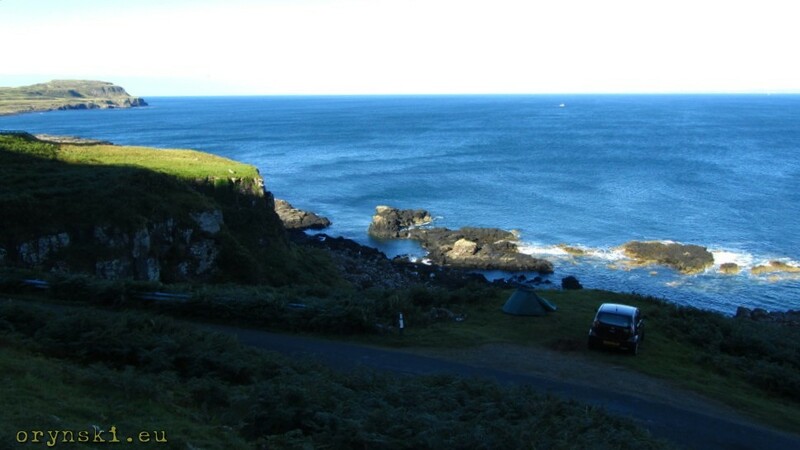 Therefore if you are looking for camping away from the crowds, I can recommend a semi-wild campsite in Ardchiavag, where for small charge collected at the nearby farm one can spend a night on the grassy patch next to the beautiful bay. Tourists are not allowed to take their cars to Iona. But this is for the better, as the island is so small, that one can easily explore it on foot and it’s much nicer if you don’t have to give way to the cars all the time. The Fionnphort car park is a paid parking, but just a few hundred metres away from the ferry slipway, on the right, there is a small Visitor Centre, where you can park for free. But the biggest attraction of Iona is of course the famous Iona abbey. It is located about 10 minutes walk from the village. On the way from nunnery you’ll pass a school, a heritage centre and a hotel. 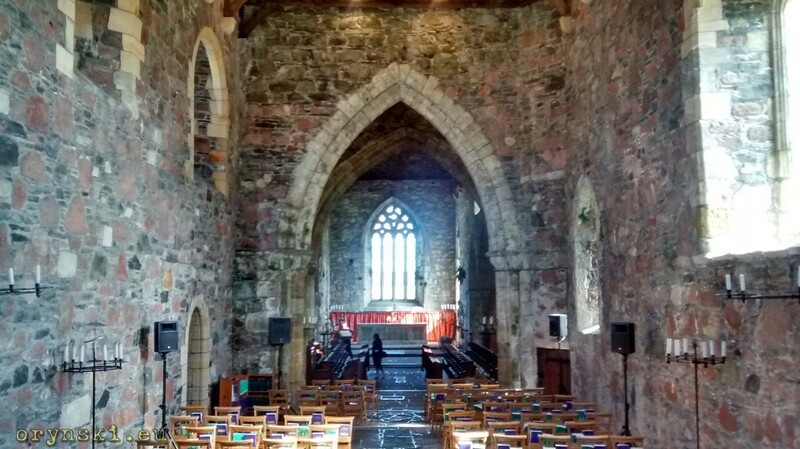 The Iona Abbey itself is maintained by Historic Scotland that offers a quality audioguide to the visitors. Here is where you can really feel the weight of the history. The abbey itself is amazing, but the little chapel next to it is over 900 years old. Poles are stunned by the fact that the celtic cross standing in front of the abbey is an original one and it was placed here over 300 hundred years before Christianity came to Poland, which is often (perhaps unfairly) seen as the beginning of our country’s history. 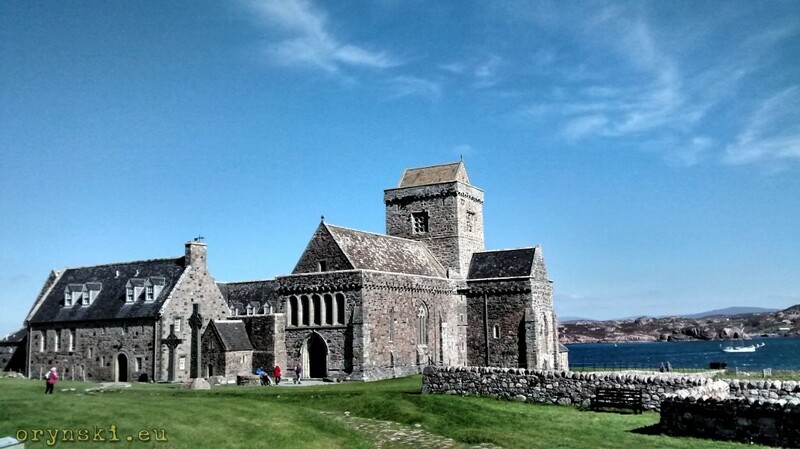 Iona is one of the oldest centres of Christianity in Britain and it’s history spans across one and half of millenium. 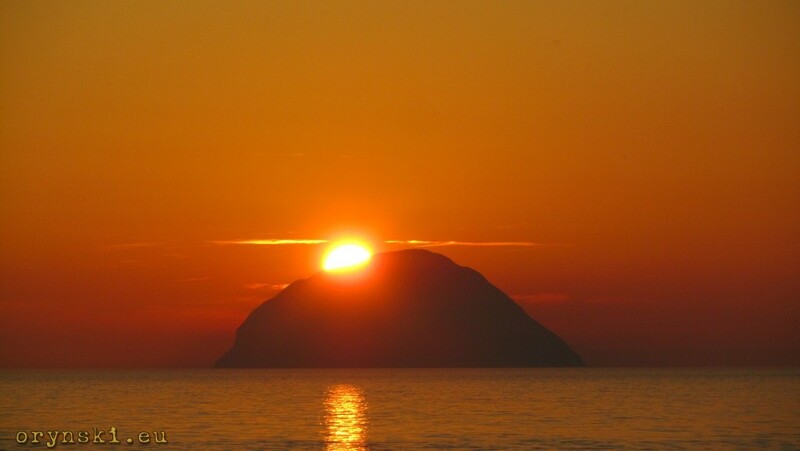 It all began when St Columba arrived to Scotland from Ireland in AD 563 (his footprints that magically imprinted themselves in the rock can sill be seen at the southern tip of Kintyre peninsula). From the monastery established on Iona St. Columba was going for the trips to Scottish mainland where, apart from evangelisation of Picts he made himself busy with performing miracles such as bringing back from death man, who was killed but noone else but the Loch Ness Monster himself. 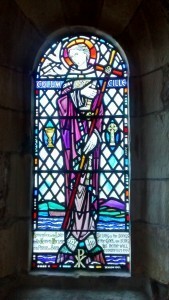 St Columba played also a significant role in the process of establishing Scotland as an independent country and the monastery on Iona become one of the main centres of Christinity in this part of the world. Iona monks had no easy life. They were at risk from the Vikings and the everyday tasks involved copying books and curving stone crosses and gravestones. 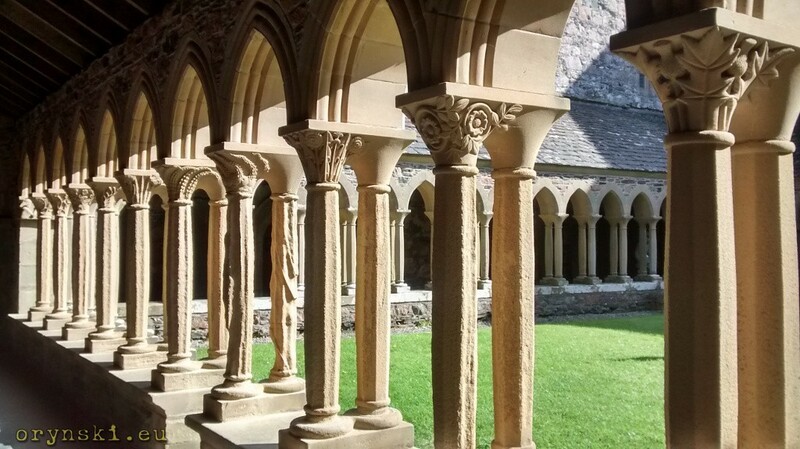 Today Iona Abbey still serves religious community and is a home to an ecumenical organisation. The monastery is the main magnet for all visitors, and rightly so, but visit to Iona does not have to be limited to the walk to the abbey and back. For example near it’s northen tip, on the western side there is a beatiful bay with sandy beach that not many people know about, and the water in the bay can be often warm enough to allow for taking a dip in it. 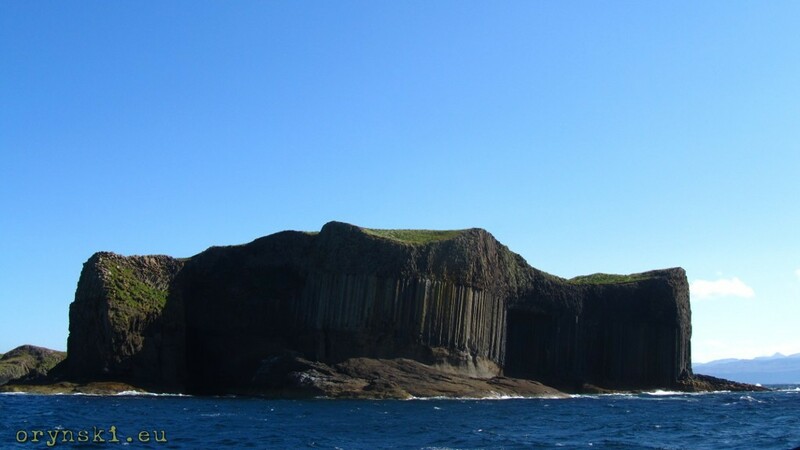 The other mandatory point on every “To see in Scotland” list is a trip to Isle of Staffa located north from Iona and known for it’s world famous Fingal’s cave. 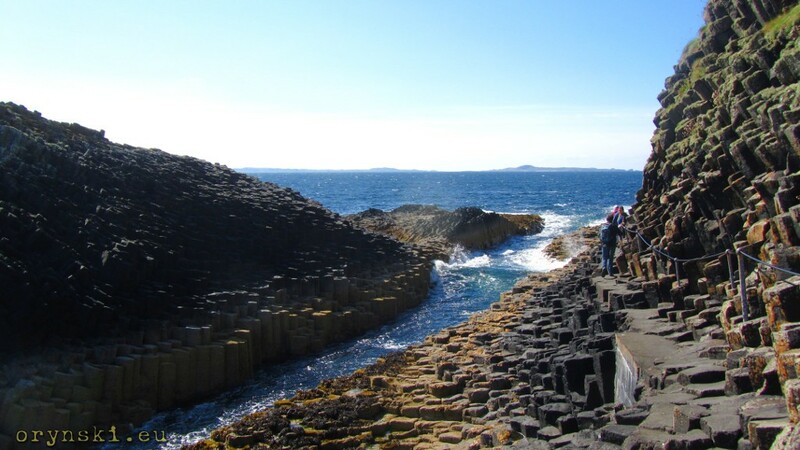 Those basalt columns raising from the sea are the opposite end of the geological formation that begins at the famous Giant’s causeway in Ireland. Even if you are like me and tend to avoid mass tourism, a trip to Staffa is an exception that is well worth the money. Tourists boats to Staffa operate mostly from Fionnphort and Iona, but also from many other places on Mull, Ardnamurchan or even directly from Oban. They all drop their pasengers off at the main jetty from where a narrow path on the basalt columns leads to the cave itself. 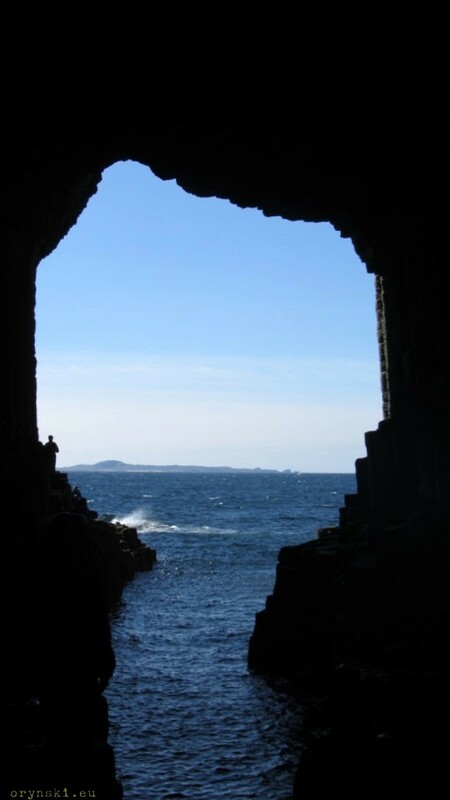 An unique acoustics of the cave inspired Mendelssohn to write his famous Hebridean Overture. Usually the trip operators allow enough time on shore to give toursist a chance to explore the island itself. 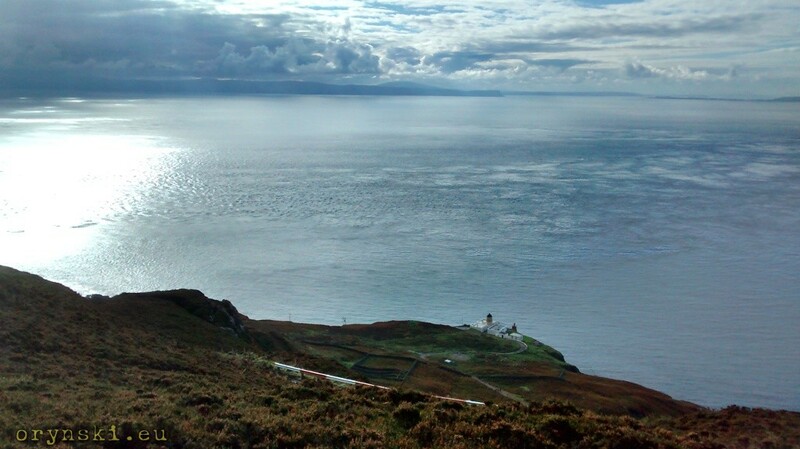 It’s well worth to climb to it’s highest point, from where one can not only see nearby islands of Lunga and Cladda but also more distant Tiree and Coll. On the other cliffs of Staffa visible from there you can see that Fingal’s cave is not the only cave that can be accessed from the sea level. After our sea adventures, it’s time to get back to our vehicle and go to explore the rest of Mull. Since the island is shaped as inverted letter E and Fionnphort is located at the end of it’s bottom bar, Ross of Mull, to continue our Tour de Island, we have to retract our steps as far as to the junction after Pennyghael, where in the wide valley after a little bridge a road branches out to the left. 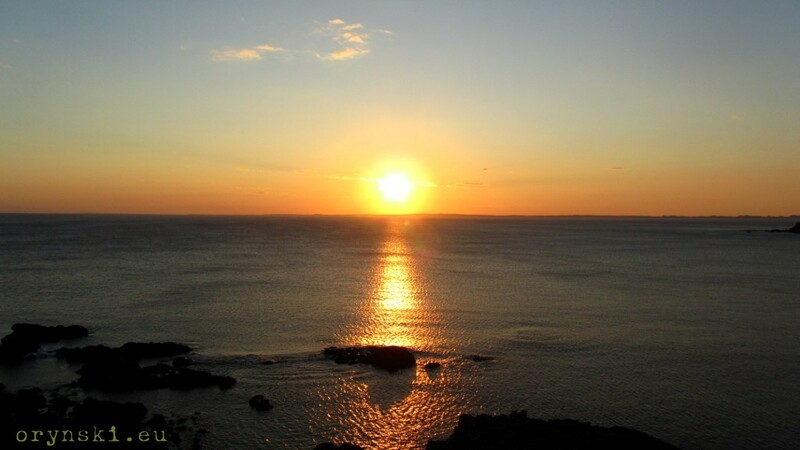 The character of the island is to change dramatically. After going around Loch Scridain, the road will cut across the pennisula where, in the forrests, eagles are known to have their nests. From the car park located a little bit to the left from the road, guided Eagle watching tours are organized. The rangers asks to do not venture to look for the eagles on your own, and during some periods there is no access to the forrest at all to allow them some privacy during hatching time. After leaving the forrest, road goes down the hill to the sea level. Here, on the fertile grounds at the bottom of the cliffs a farming activities are carried out. Across the water a little island with it’s only house can be visible. It’s Inch Kenneth which has an interesting history. One of the monasteries established by St. Columba followers was located there – and one can find it’s remains even today. In less distant history a biggest British fan of Adolf Hitler lived there and two decades later house became a property of the well known communist. Local rumors were that the Soviet submarines were calling to the lonely house. Soon the road turns East for yet another time. This time to go around Loch na Keal. First we will drive the narrow road on the terrace between the cliffs and the water, but soon the perspective gets wider. Stone rubbles give way to the grassy patches (a perfect spot for wildcamping!) 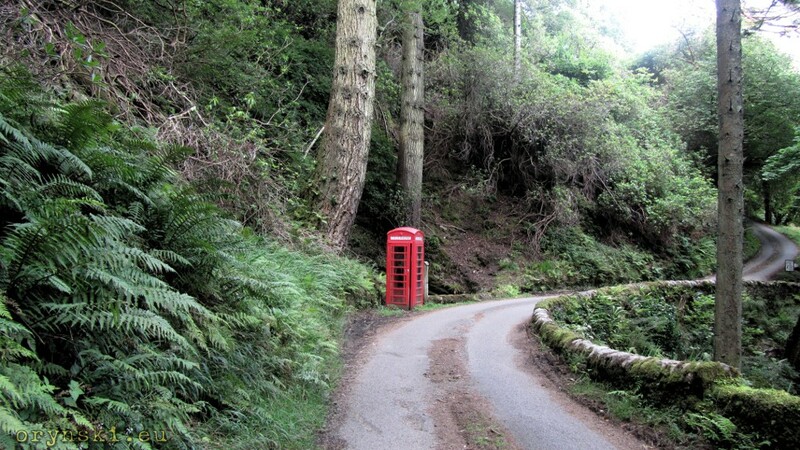 and at the loch head we will find ourself in a typical village with it’s famrs, forrest and fields. 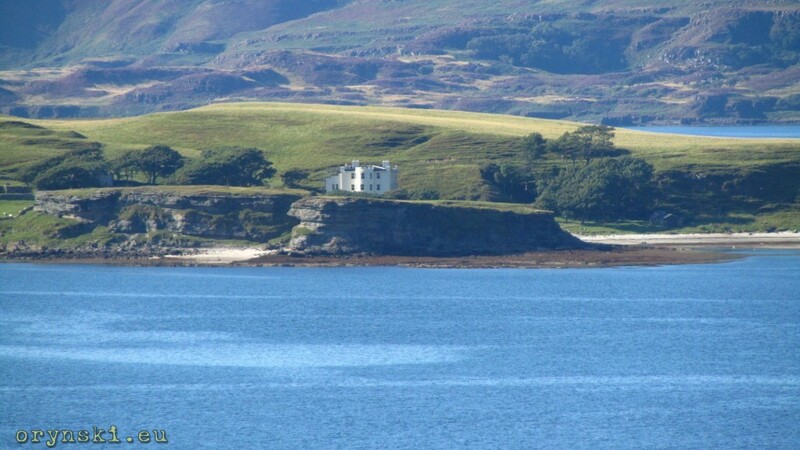 This is the most narrow point of Mull and if we continue East, we will find ourself in village of Salen in no time. But there will be time for that later. Now, let’s continue along the bank of the loch, having to the left a little island of Eorsa (local legend states that it is a home to thousands of adders) and soon the road will turn north again. Here, at the small junction next to the little primary school you can turn left and after just a couple of metres reach a small ferry slipway from where ferry to Ulva lives. 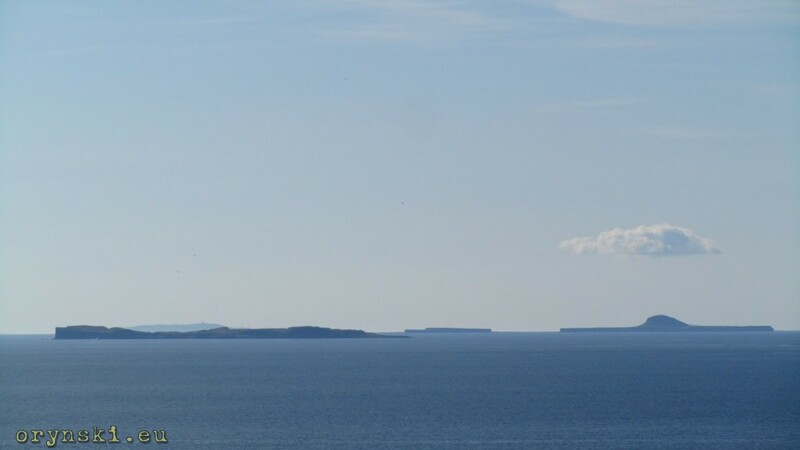 Ulva and it’s little sister Gometra (the two islands are connected with a bridge) are today inhabited by about 20 people. They both have unique nature offering landcapes that nobody would expect to see on a little island in Hebridean archipelague. Ulva was also the birth place of Lachlan Macquire, a governer of New South Wales whos merits in turning Australia from pennal colony into the proper state made him known as the Father of Australia (I guess an aboryginal people would have a different view on it, but that’s the different story). It is worth to mention that Ulva Ferry is one of the places that offers trips to Staffa as well, but it’s worth to check beforehand, as boats leave from here only in certain days of the week. Now it’s time to look up again. 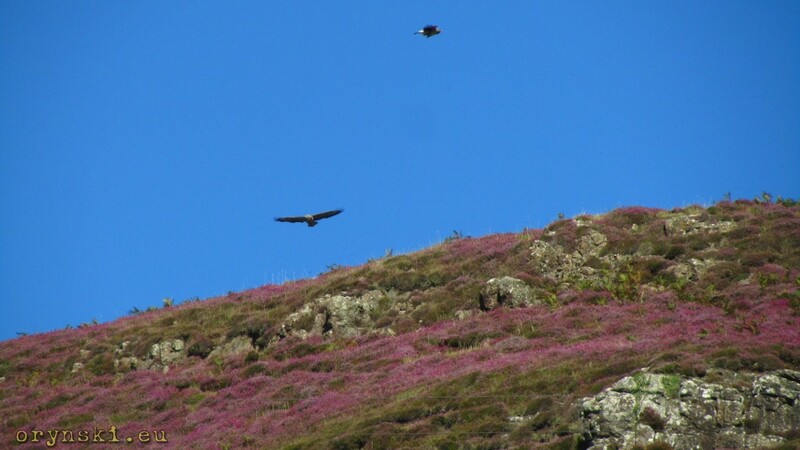 This part of Mull is known of being home to majestic birds of prey. 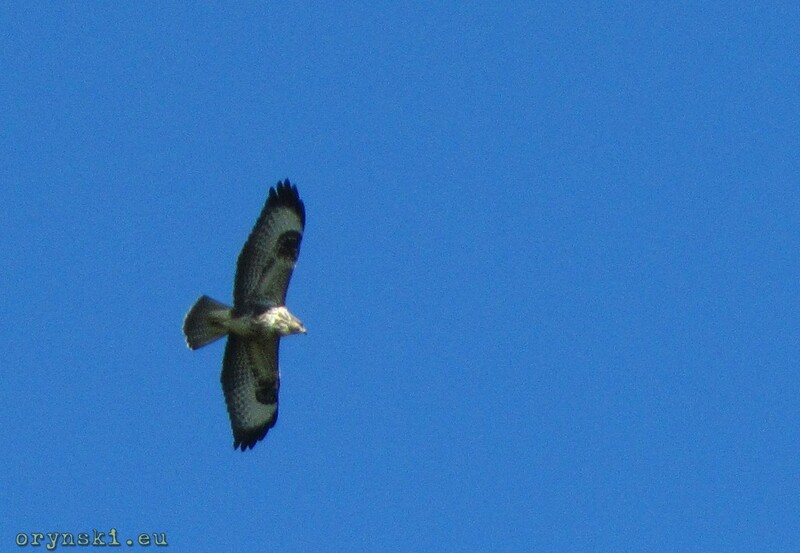 Apart from eagles mentioned before, white tailed eagles and sea eagles are a common sight here. Those waterfalls contains three sets of waterfalls (I am still having fun with language here). First set of the waterfalls of Eas Fors Waterfall is located slightly up from the road, behind some trees. Second – just below the bridge. The third one, the most spectacular, is where water drops from 30 m high cliff straight into the sea. Between second and third ones there is a little grassy patch that can be a perfect spot for a picnic or a wild camping, as long, as you are not afraid that when getting up in the night to spend a penny you might go wrong direction and join the water in it’s spectacular show to prove the laws of gravity right. Of course it is possible to get down to the bottom of the cliff, but that involveds a 30 minutes walk around via the access point south from the bridge. Continuing our trip around Mull, the road will again start to climb up. Here we can find some nice houses and a little church of Kilninian. Altough the church itself is not the most spectacular one and the grave slabs located in it are not amongst the most amazing examples, it’s worth to know that this place has even longer Christian history than Iona: there are some records suggesting that there was a church here as far as in early 400’s, when St. Ninian traveled across Scotland trying to bring Christianity to Picts. He is a very popular saint in Scotland despite the fact that there is very little information about him available. Traditionally he is said to be studying in Rome from St. Martin himself. 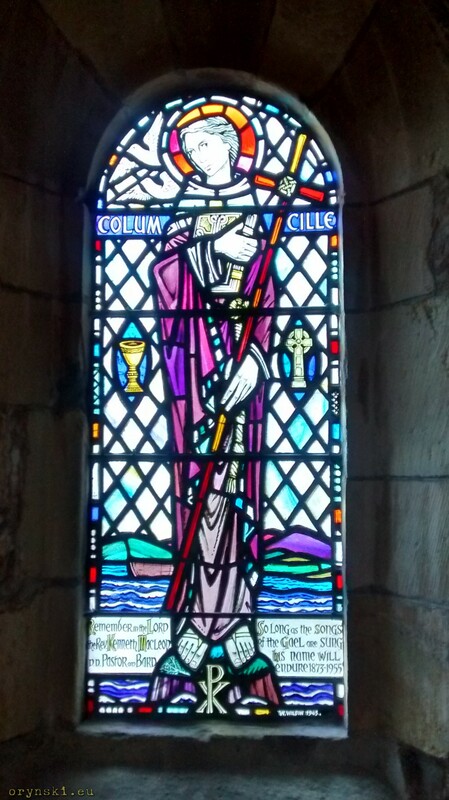 But the fact that St. Columba had to start the whole business of Christianity from scratch just a century later suggest that efforts of St. Ninian had very little impact. On Mull you can have breakfast watching eagles having their breakfast. Along this stretch of the road apart from this little known historical factoid, one can find some picnic tables, again offering a possibility of picnic or nice spot for wild camping. 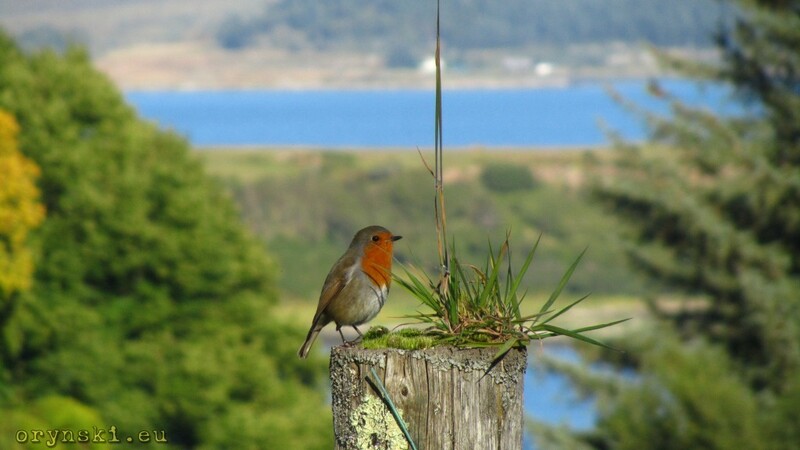 A breakfast at the table with the panorama of Ulva, Gometra and Treshnish islands on one side, and the eagles hunting over the heather covered hills on the other is an experience never to be forget. 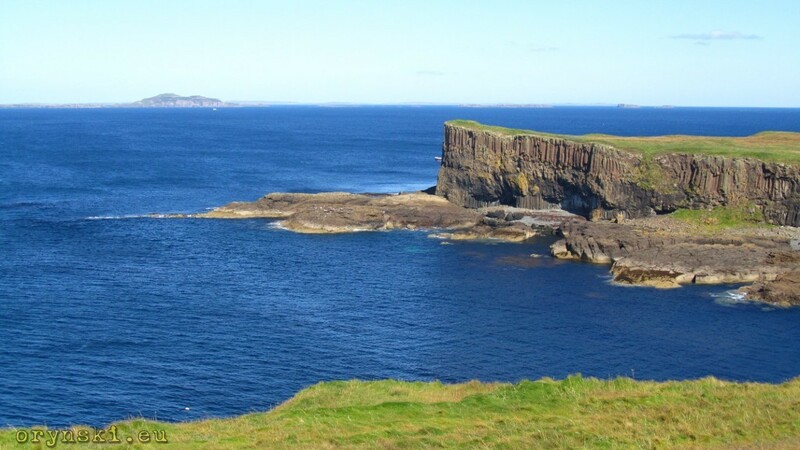 But birds of prey are not the only reason why it’s is worth to have binoculars there – Treshnish islands, including Fladda and Lunga, have some spectacular rock formations and are a seabird reserve. In the past the islands were inhabited and ruins of the castle, church and medieval forts prove that Threshnish had really interesting history. The tarmac road doeas not reaches the tip of the peninsula. Instead it turns North to take us across the heathery fields to the high cliffs (another nice spot for wild camping) and then goes dfown to the golden beaches of Calgary (where a little more official campsite is located). After Calgary it climbs up again, across yet another peninsula and soon it arrives at the quite big (as per Mull) village of Dervaig. It is worth to take a stroll along the row of the little white house built along its main road, as if not for the cars parked in front of them, it could give a perfect impression that we have travelled back in time by 200 years. A local church is also a nice place to visit. North from Dervaig there is one of the most spectacular bits of road on Mull. A single track road writhes through the heathery hills, then leads along the chain of the little lakes. Where the landscape again turns into farmlands, it’s a sign that we have almost arrived at Tobermory – the capital of Mull. But before we enter the town, let’s make a short side jump and turn left into the road to Glengorm castle. Although the castle itself was turned into luxury B&B and it interiors are available only to guests, we can park our car on the car park provided within the estate and go for a stroll. The road along the row of the wind-battered trees takes us to a place from where a beautifl panorama of Coll and Ardnamurchan opens. 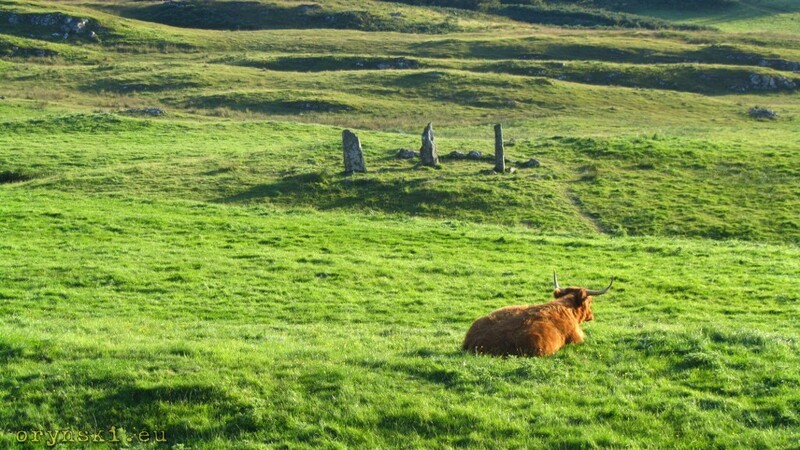 On the green fields with grazing Highland Cattle there is well preserved neolithic stone circle. 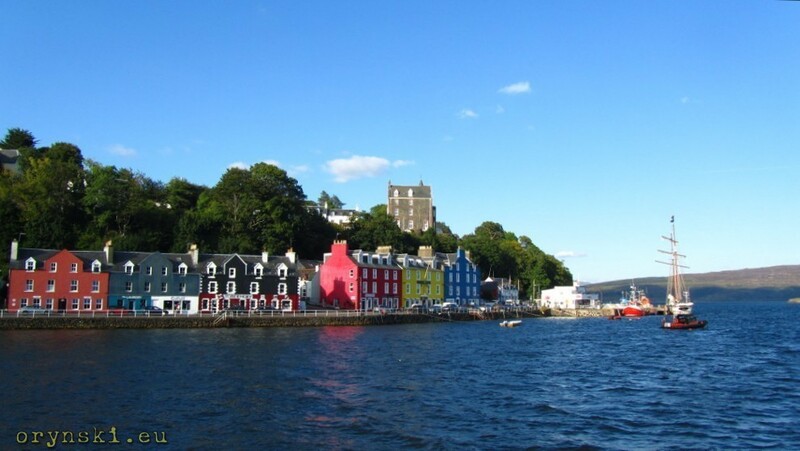 As per Tobermory it is one of the most picturesque towns in Scotland. A main street of this place inhabited by about 700 people contains a row of brightly coloured houses bordering the bay in which the marina is located. A small but interesting museum tells the story of Mull, one can also visit a famous whisky distillery. And if you are rather for less strong drinks, the products of local brewery are one of the best I had in Scotland so far. 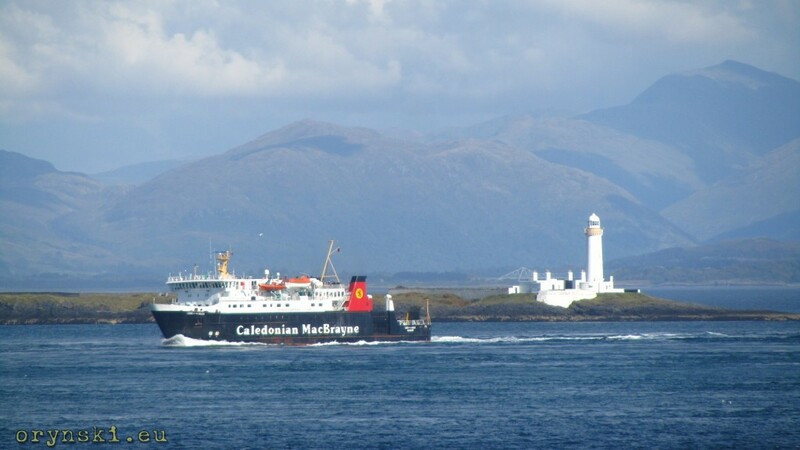 You can also take a ferry trip to Kilchoan on Ardnamurchan, that will be unusual in that respect, that people of Kilchoan will travel for their shopping in opposite direction – in most places of Scotland it’s islanders who travel to mainland to get their supplies. 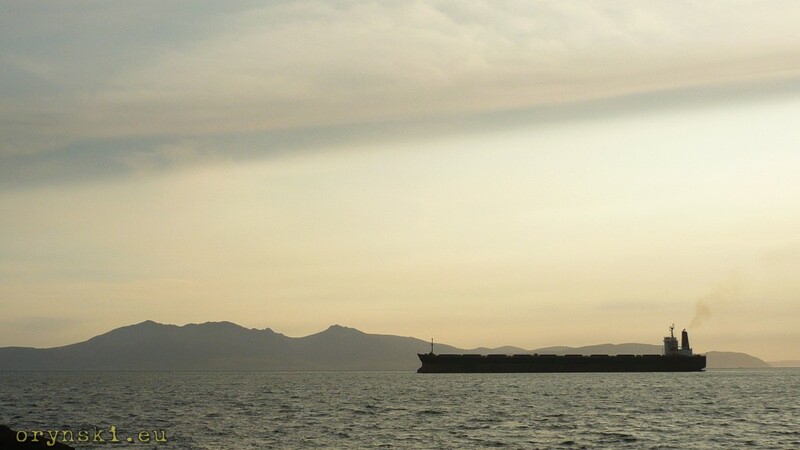 While on the ferry don’t forget to look into the water, maybe you’ll be the one to spot the sinken Spanish galeon that, according to the local legend, was carrying an enourmous treasure. Those, who don’t go to Ardnamurchan from here, after visiting the town will have to turn south. 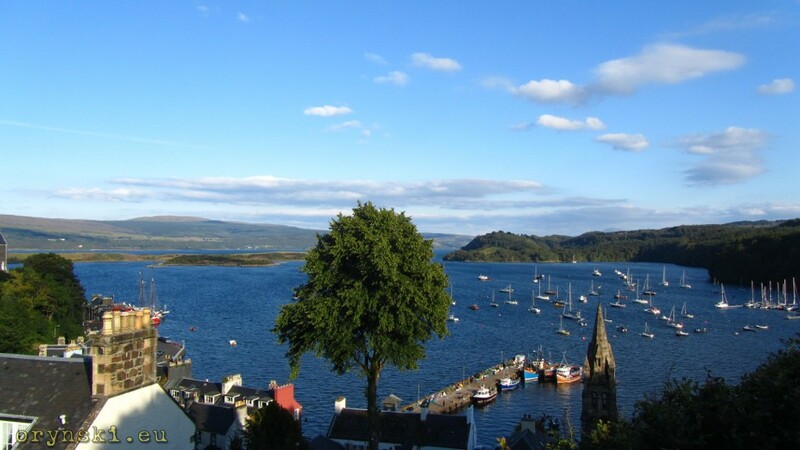 But before you go, don’t forget to climb (or drive) to the one of the hills that surround the Tobermory bay, as the view from there is amazing! 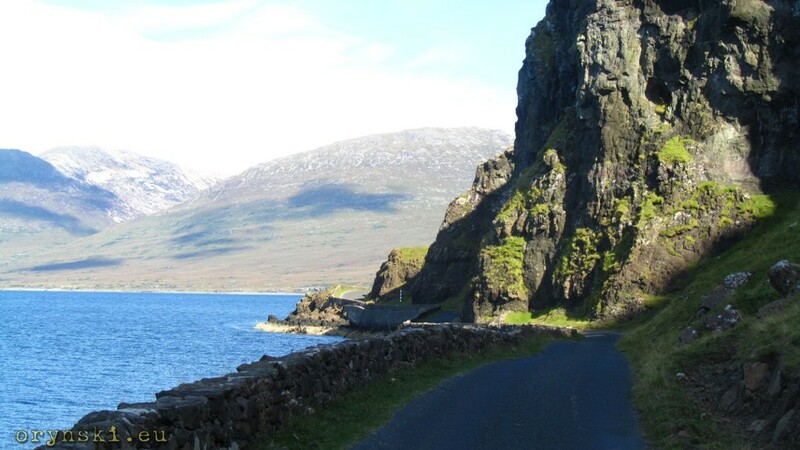 Driving south, you will have to battle an unusually busy road, as this is a main trunk road for mull connecting it’s most used ferries with it’s biggest settlement. When you grow tired of pulling into passing places on this single track road to let the huge timber trucks pass, you might want to stop and visit remains of the Aros castle (just before Salen) or the old Pennygown cemetery. Local legend states, that fairies used to live nearby and they were keen to grant a small wishes of the local people until someone expected them to have a little stick turned into the ship’s mast. The fairies felt offended with this demand and left this area, never to be seen again. If you want to visit place where the most beautiful landscapes of Scotland change like patterns in kaleidoscope, Mull is the place to visit for you. And I hope that this little guide will help you to realise this dream without seeking for the magical assistance of the fairies. 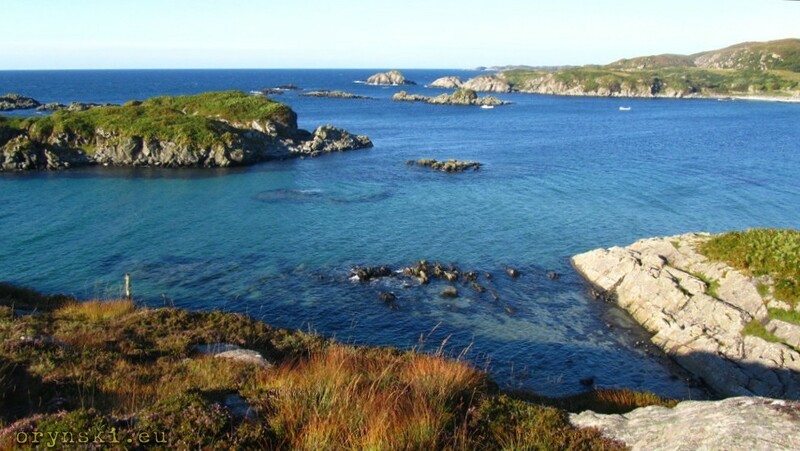 Although some tourists operator offer one day trips offering chance to see main highlights of Mull and Iona, it is worth to plan at least three nights on Mull to be able to appreciate at least fraction of what it has to offer.